On Tuesday, news surfaced that the Wizards point guard John Wall would be out another 12 months after rupturing his achilles while at his own crib. How the injury occurred remains unknown, which makes this all the more interesting, but John Wall isn’t trying to hear any jokes about it. Steelers wide receiver JuJu Smith-Schuster decided to have some innocent fun with the news and ask John how the injury happened. “Bruh what you doing at the crib,” he wrote in the comment section of Bleacher Report post while leaving a laughing emoji, but Wall didn't find it amusing. John clapped back at JuJu and called him a "funny guy," before saying he'll see him around. “@JuJu funny guy and all that, but I’ll see u around bra” John left under JuJu’s comment. 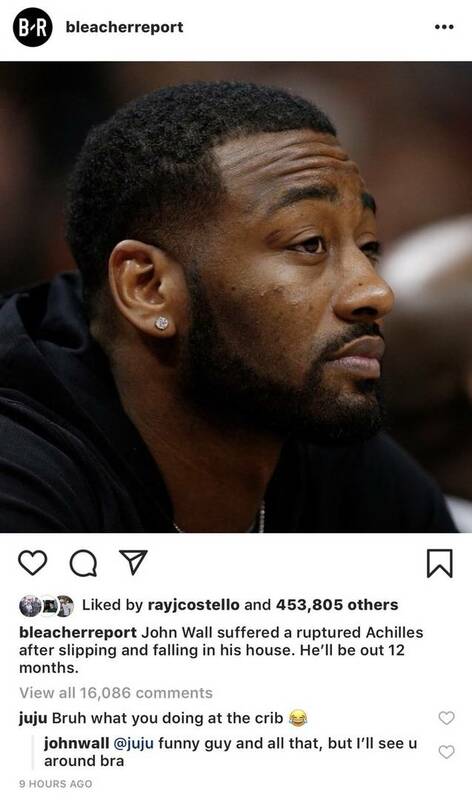 Now JuJu’s comment didn’t seem to warrant such a hostile response from John, but it’s safe to assume he’s dealing with a lot right now knowing he’s going to be off the court for another year and a half. So we’ll give him a break, but hopefully this aint that serious. Check out John’s response to JuJu’s comments (below) and sound off in the comments. Unnecessary response or nah?